"Legrand Tour: The Music of Michel Legrand"
Michel Legrand is the legendary film composer who wrote the scores to the film musicals “The Umbrellas of Cherbourg,” “Young Girls of Rochefort” and “Yentl,” as well as countless film scores and themes, most notably with the filmmaker Jacques Demy. Some of his hit songs taken from films include “What Are You Doing The Rest Of Your Life,” “Where Is It Written?,” “Watch What Happens,” “The Windmills Of Your Mind,” “I Will Wait For You,” “Sweet Gingerbread Man,” and ‘You Must Believe In Spring.” Michel Legrand won three Academy Awards, five Grammy Awards and ASCAP’s Henry Mancini Lifetime Achievement Award. The lyricists he’s worked with include Alan & Marilyn Bergman, Norman Gimbel, Sheldon Harnick, Hal David and Earl Brown. The gorgeous arrangements in “Le Grand Tour” are by Tex Arnold, who plays piano. The wonderful Jon Burr is on bass. 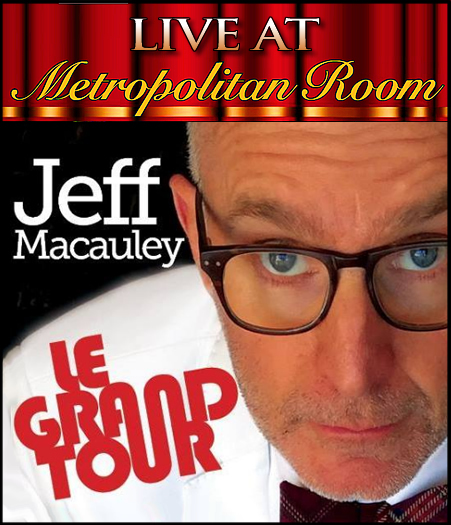 Jeff Macauley is a 2016 MAC Award nominee and Backstage Bistro Award winning cabaret singer. In previous shows, he explored the rich world of early musical films in “Hollywood Party: Movie Songs 1928-1936,” and most recently paid tribute to beloved singing star and Hollywood icon Dinah Shore, on the occasion of the 100th anniversary of her birth, in the acclaimed revival of “MWAH! The Dinah Shore Show,” for which Jeff received Backstage magazine’s Bistro Award in 1998. Jeff was nominated for a 2016 MAC Award for Male Vocalist for “Mr. Lucky: The Songs of Henry Mancini,” which was also nominated for a 2015 BroadwayWorld.com award for “Best Tribute Show.” In 2012, Jeff’s show “It Was Me: The Lyrics of Norman Gimbel,” was nominated for a BroadwayWorld.com award. “It Was Me” has been performed in New York and Los Angeles and is availalbe as a studio recording on CDBaby, iTunes and Amazon. Look for Jeff on Facebook and Twitter and visit jeffmacauley.com.